Don’t you love it when you stumble upon amazing artwork? Little did I know that I would be sideswiped by their fall show Soaring High, Falling Hard, by Rebecca Jewell. Yes! 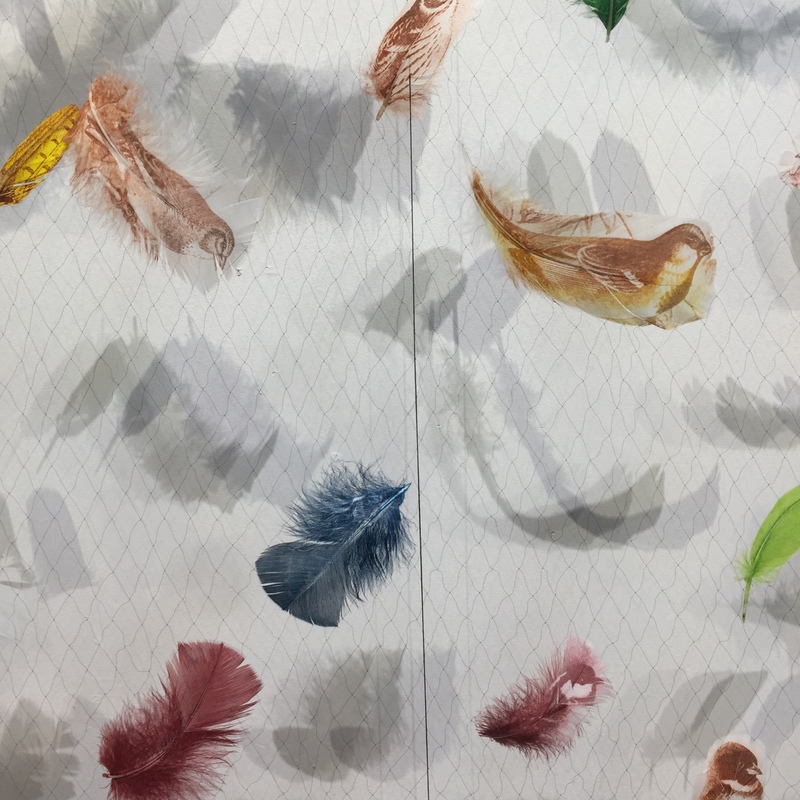 Real feathers, and some with bird images printed on them Not only is the work beautiful, it is technically stunning. 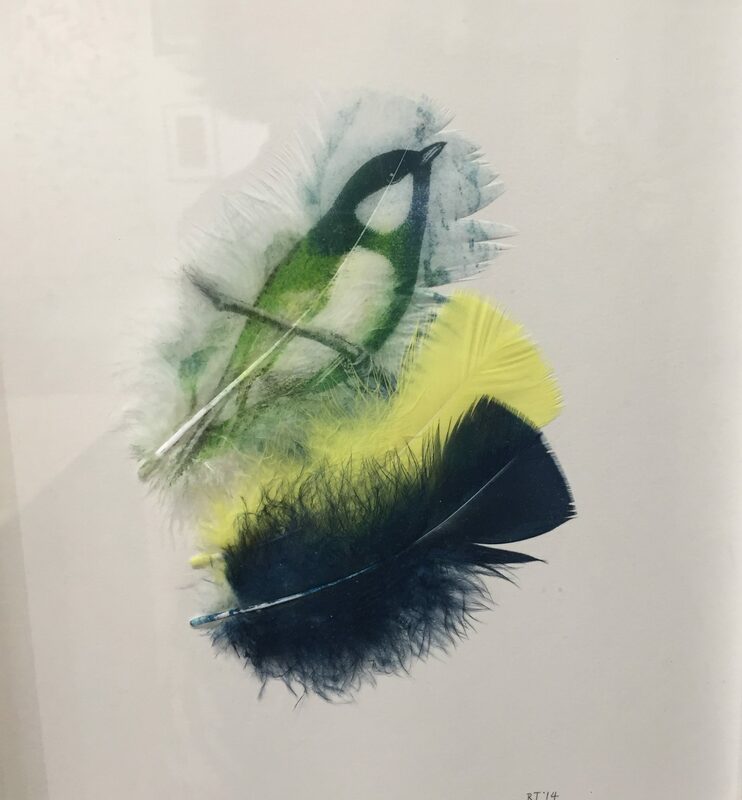 Intaglio printing on….feathers?!!! Here is an article about the printing process. The subtitle for the show, Soaring High, Landing Hard is the veneration and exploitation of birds. 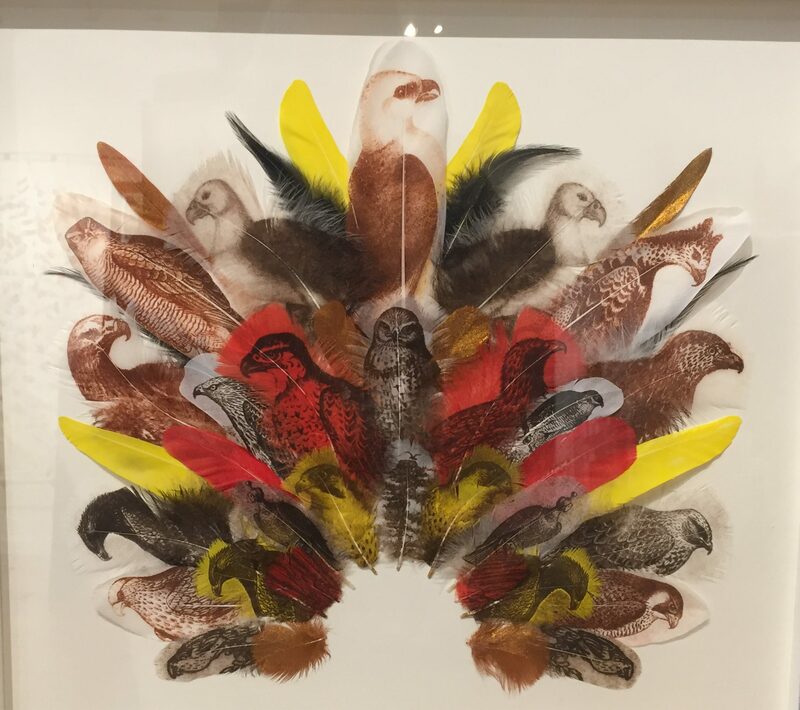 Jewell references the extinction of species, and the abuse and threats to birds. Mist nets, for instance, are used to capture birds, for both research and profit motives. All the while, the work delights in avian beauty. 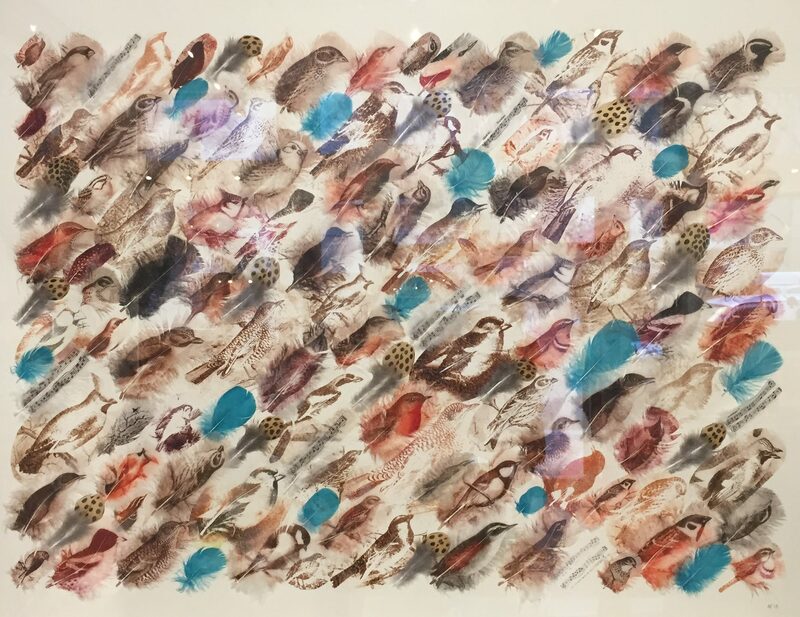 Rebecca Jewell is not an aboriginal artist but she has lived in Papua New Guinea and studied Cultural Anthropology at Cambridge. Rebecca Jewell has a PhD in Natural History Illustration from the Royal College of Art. She is an Artist in Residence at the British Museum. Please click here for her detailed website and here for more information from the Rebecca Hossack Gallery. You’ll find a short, informative video here. If you’re in Victoria, you’re in luck. 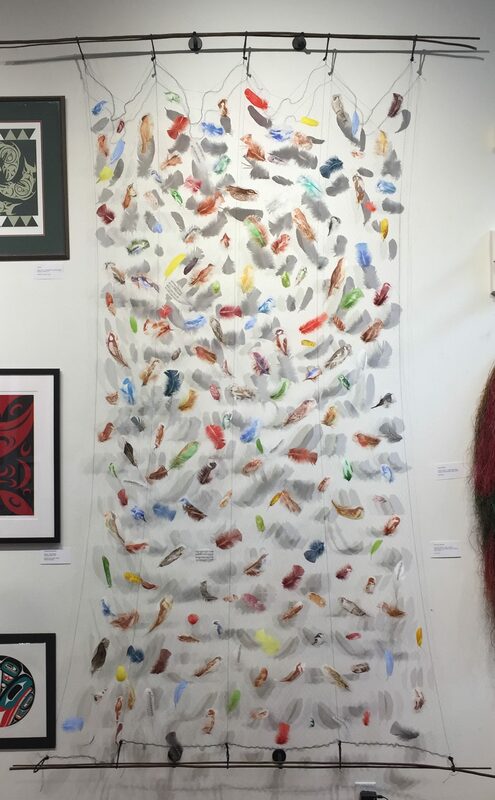 Some of this extraordinary work is still on display at Alcheringa Gallery. This entry was posted in Alcheringa Gallery, Rebecca Hossack Gallery, Rebecca Jewell and tagged Alcheringa Gallery, Rebecca Hossack Gallery, Rebecca Jewell on January 26, 2017 by terryvatrt. Stunning, beautiful work! Lovely video too. Thanks for the post – and highlighting this artist. Thanks for reading! Yes, the work is stunning, and many layered. Amazing ingenuity on display, with a message. Thank you. Thank you for reading The Art Caravan. The shadows cast by the feathers add so much depth and apparent motion. It would be wonderful to watch sunlight move across the netted piece. Agreed. They add a whole other layer to the work. There is nothing more exquisite, more elegant than the little songbird. Well, perhaps Audrey Hepburn. This looks to be a stunning exhibit requiring serious artistic skill and effort but the result is so adroit and light and effortless. Yes, good point, Holly. This is definitely an added tension that contributes to the success of the work.